What would be an amusement park without a Ferris wheel? 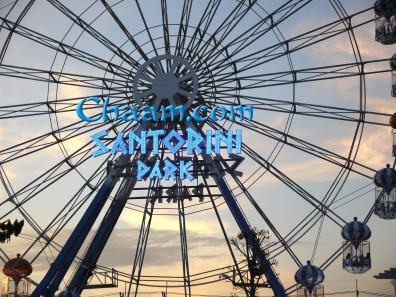 The ferris wheel from Santorini Park is about 40 meters high and has more than 20 cabins. One of them has, which in Thailand is not taken for granted, handicapped access. so you can enter the cabin also by wheelchair. Additional space for accompaniment is also available. After paying 120 Baht each person, the three rounds journey will start. The view from the top is magnificent, you can look at both sides of the mountains and you see the long Petchkasem Road, the Thailand highway 4. The ferris wheel is equipped with modern technology and it gives a very secure feeling. The staff is always friendly and polite. To queue up with the Thais is even not a problem, because they are polite and not pushing in a queue like in Europe. At the bottom of the ferris wheel are attached two tunnel slides for children which are free for use. 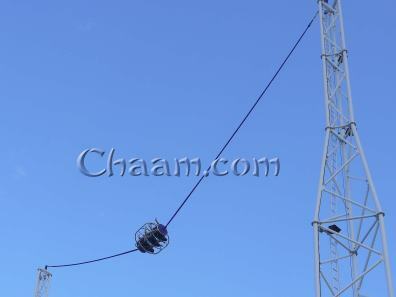 Another attraction is the so-called G -Max Reverse Bungee. The bungee is attached to two 40-meter high steel girders and is has space for three people. Also here you only find good trained personnel, whereby safety comes first. 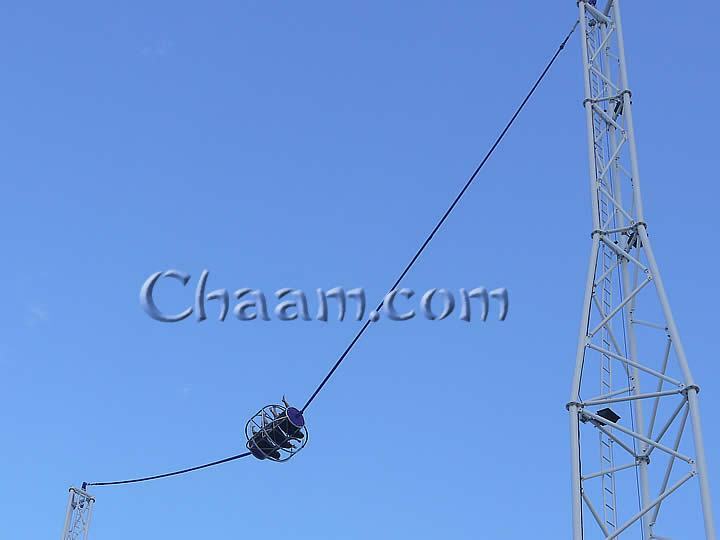 Once the bungee ropes are fully stretched, the trip starts by pushing a button and the cabin shoots within two seconds to lofty height of about 50 meters and rotates slightly around its own axis. The bungee is pure fun for young and old. 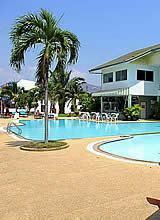 But here, too, must be paid 120 Baht per person, for a pleasure, which only takes a few moments. The G-Max Giant Swing has a similar structure as the G-Max Reverse Bungee. However, it is not started on the ground, the cabin is pulled into the sky by 40 meters. Subsequently, the holder unlatched and the cabin swings at high speed between two large steel girders throughout and eventually settles out slowly. Here, too, about 4 minutes big fun 120 Baht will be due. 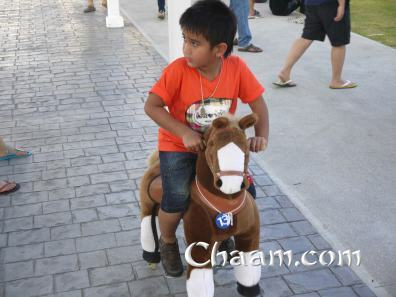 The Santorini park also offers some attractions for small children without getting a rush of adrenaline. For example the Ponycycles, where a child can ride through the park. 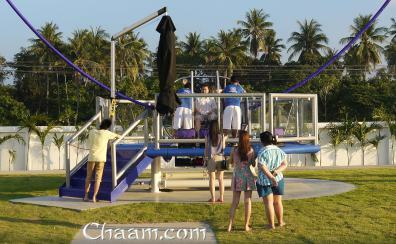 Every child loves it and wants to jet around with it - for 120 Baht every 40 minutes. 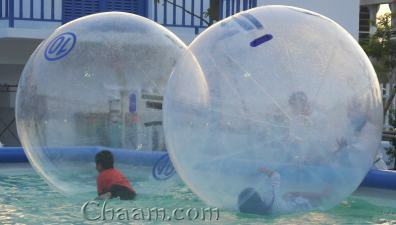 A funny-looking attraction are the large plastic balls in a big swimmingpool. A child can crawl into these balls, and then try to run inside the ball on the water. 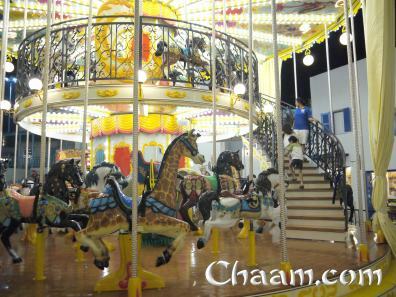 Finally there is the beautiful, large carousel to be mentioned that glides with soft music along on two levels. The carousel is classic with many details, it has mainly horses and giraffes and there are no bright lights or loud sounds from the carousel, as is often found in Europe. The Santorini Park is a beautifully landscaped, very clean theme park, where the most parts are suitable for disabled guests in wheelchairs. Alone in the shopping area, where the small houses are, are a few steps. Otherwise the park is a large plain area. The staff is friendly, helpful and was well trained on the attractions, that you will have a safe feel when using the bungees. In terms of safety and control of the guests was a lot invested in the Santorini Park, because you find on every corner a camera, which records every move of everybody. The numerous cameras gives parents a sense of security because in Thailand, unfortunately, often children are kidnapped from the street and then sold abroad. Negatively we found that the prices are excessive for Thai conditions. For every attraction, some of them takes only a few minutes, costs 120 Baht, which is nearly three Euros. The food and drinks are reasonably priced. For a mini-snack for two people we paid 200 Baht and for a beer between 90 and 180 Baht. At weekend 50 Baht admission to be paid, for all persons greater than 90 centimeters. The entrance fee includes nothing. Thus, an average family with two children is at 2.000 - 3.000 Baht, which is about 50 - to 70 Euros, which will be spent within two hours, when the attractions are used and snacks are eaten.